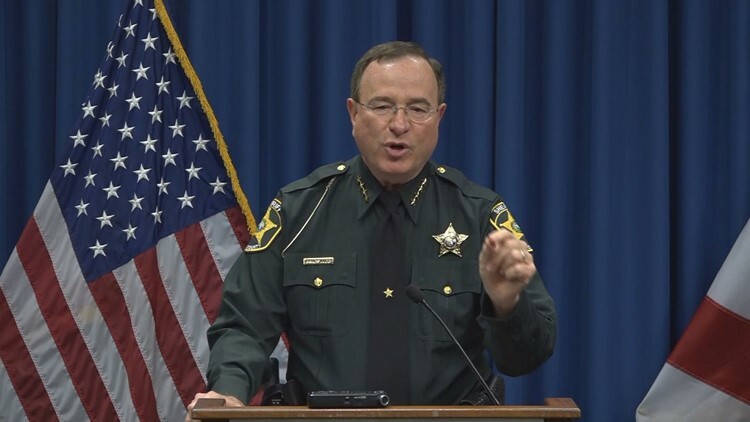 Polk County Sheriff Grady Judd addressed media members on Friday, Feb. 23, 2018. The debut of Polk County Sheriff Grady Judd's podcast is everything you'd hope for...and so much more. Que the heavy guitar riff, add in the outspoken and enthusiastic Polk County sheriff and you have the first episode of Sheriff Grady Judd’s podcast. As the music and intro fades, listeners are reminded of what they came to listen to: This is ‘Not in My County’ with Sheriff Grady Judd. In the first episode, labeled ‘Don’t Burn the Bagel,’ Sheriff Judd lets listeners know who he is. “This Podcast is produced by The Ledger, my hometown newspaper in Lakeland, Florida. If you’re from someplace else in the nation, or if you’re local and you live under a rock, you may not have heard of me. I’m known for being outspoken. I’m really not outspoken, you know, I’m really like President Truman,” Judd says just over a minute in. He says he’s like Truman because people said he gave them hell, but really, he says it’s just the truth. “So, you don’t want to go to jail? Behave,” Judd says. After an ad from Bartow Ford played, Judd dived into one of the craziest stories he could recall: A story about a man who may have crossed the line after his wife burned his bagel. “We arrested a fella who shot at his wife for burning his bagel," Judd says. 2. Don’t serve him the burned bagel. Judd says thank god the man was a bad shot because he missed her. Another Bartow Ford ad rolls before Judd dives into what makes him angry. “It’s the people who don’t pay attention to keeping children safe," Judd said. Judd then names off a number of school shootings that have happened across the county. He explains the fight that has been put up to have armed guardians at schools. Judd says in his county they were going to train people to shoot. And, if anyone came to hurt people in churches, schools, or anywhere, he has people trained to shoot them. And shoot them a lot. A rad guitar solo leads into an ad for air conditioning before Judd returns with a father of a Marjory Stoneman Douglas shooting victim: Andy Pollack. Judd introduces Pollack and talks about how he’s been making changes across the state to keep students safe. Pollack recalls how the two became friends. Judd reached out to Pollack and asked him to talk to the school board about what happened to his daughter at Stoneman Douglas. He also spoke to the school board to get the guardian program going at their schools. Judd said because of Pollack's work, there are now armed guardians or resource officers in every public school and charter school across the state. Pollack talks about his experience going to Tallahassee and talking to legislatures about the importance of the guardian program and keeping students safe. After Pollack and Judd hang up, the phone listeners were treated to the sounds of more rock music. Judd closed the podcast by asking listeners if they had anything they wanted to ask law enforcement. He told listeners to just send him questions and he would either tell them what he knows or make something up—whatever is more interesting. Then, he changes his mind and says he would just tell the truth. Want to hear more from the sheriff? You can listen here. Want to read entertaining posts on the criminal activities that Sheriff Judd encounters in Polk County? Check out the sheriff's office's Facebook page.